It has been awhile since I updated anything here. Mind you, I have every intention of updating the site. It just takes time……. But as my online presence is generating more action for me these days, so I’m moving the update effort to the front burner. A couple days ago, I had my first sale ever on ArtFlakes, a print-on-demand service based in Germany. 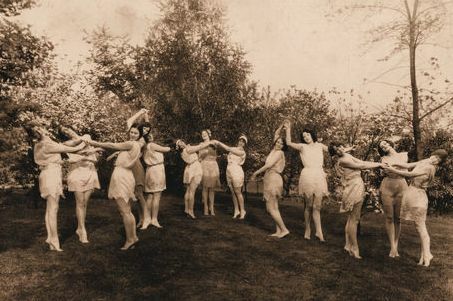 Somebody bought a canvas print of my vintage photo “Aunt Mary’s Dance Class.” My art and photos on this site have been getting more attention lately, as evidenced by the email notifications. I haven’t updated anything on the site recently, so the sale set it in motion. I uploaded a bunch of new art, mostly dog portraits, but also some odds and ends. Since a vintage photo sold, I posted the photo of the Zachary Family scattered around on the porch and in front of their house in Cooleemee NC. I also put up my Brownie Scout crayon drawing that I did ca. 1961 when I was about 6 years old. People loved it when I first posted it on Facebook, so you never know what might generate a sale or two.